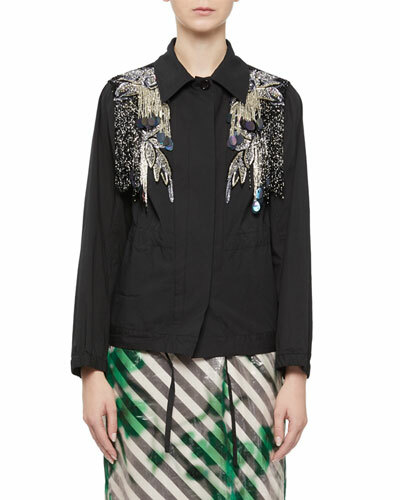 More Details Dries Van Noten jacket embellished with beading and paillettes at shoulders. Spread collar; button front. Long sleeves. Semi-fitted. Straight hem. Cotton/spandex. Imported. 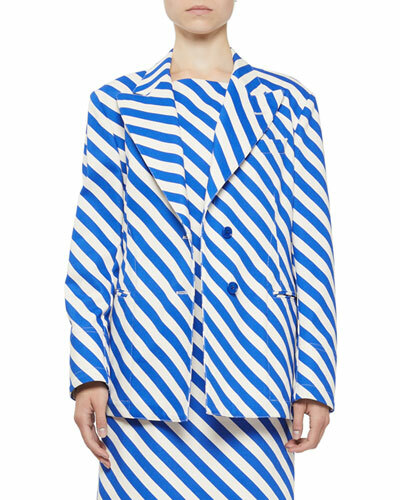 More Details Dries Van Noten striped blazer jacket. Notched collar; two-button front. Long sleeves. Side besom pockets. Standard fit. Cotton. Imported. 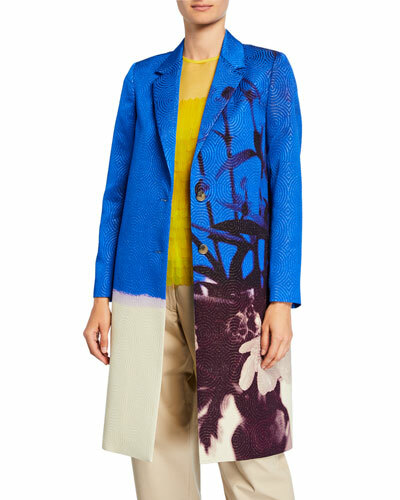 More Details Dries Van Noten abstract floral-print coat. Notched collar; open front. Long sleeves. Relaxed silhouette. Knee-length. Straight hem. Cotton/linen. Made in Belgium. 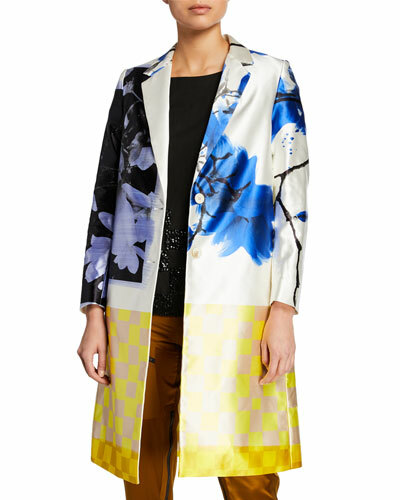 More Details Dries Van Noten coat in metallic swirl jacquard twill with floral print. Notched collar; two-button front. Long sleeves. Slim silhouette. Knee length. Viscose/cotton/polyester/nylon. Made in Belgium. 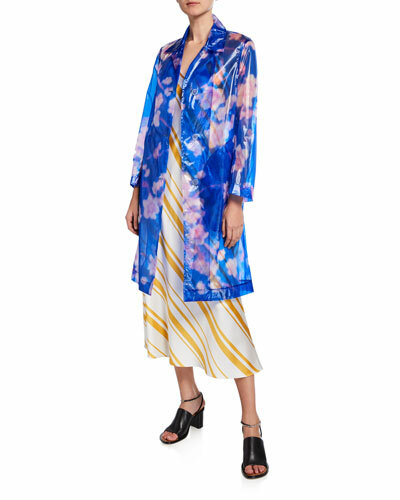 More Details Dries Van Noten coat in transparent stripes. Notched collar; button front. Long sleeves. A-line silhouette. Self-tie belted waist. Midi-length hem. Polyester/silk. Imported. More Details Dries Van Noten coat in sheer floral print tulle. Spread collar; three-button front. Long sleeves. Side slip pockets. Slim A-line silhouette. Knee length. Nylon/silk. Made in Poland. 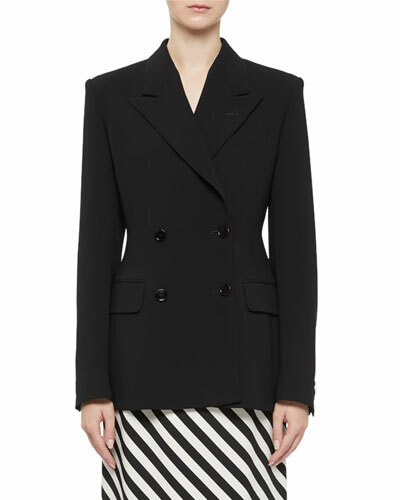 More Details Dries Van Noten jacket with seam details and buffalo horn buttons. Peak lapels; double-breasted button front. Long sleeves; button cuffs. Hip flap pockets. Slim, tailored silhouette. Straight hem. Shell and lining, polyester. Made in Morocco. 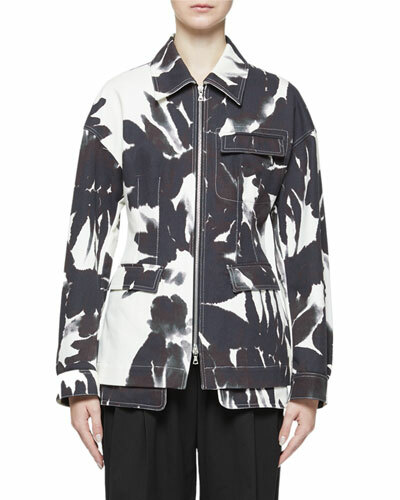 More Details Dries Van Noten jacket with abstract print. Spread collar; button front. Long sleeves; elasticized cuffs. Buffalo horn buttons. Drawstring waist. Side slip pockets. Cotton. Imported. 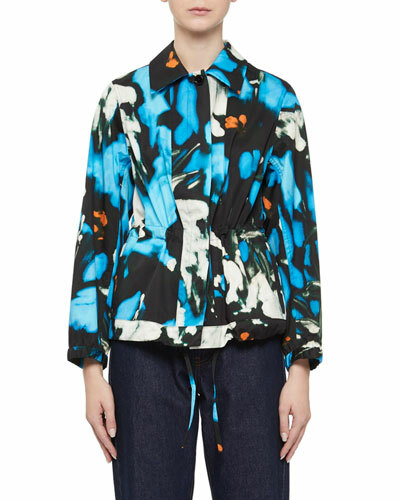 More Details Dries Van Noten jacket in painted floral denim. Spread collar; zip front. Long sleeves. Three flap pockets. Cinched waist interior. Relaxed fit. Straight hem. Cotton. Made in Belgium. 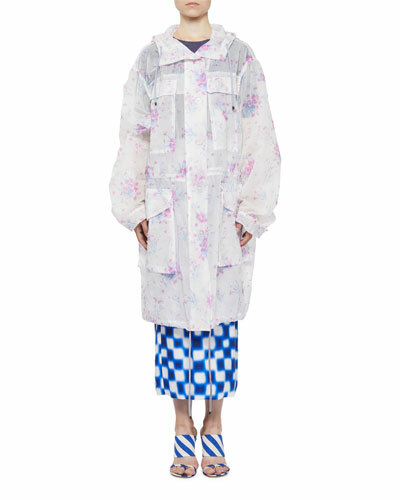 More Details Dries Van Noten sheer coat with floral print. Drawstring hood; button front. Long sleeves. Four flap pockets. Drawstring hem. Oversized fit. Nylon/spandex. Imported. More Details Dries Van Noten car coat in taffeta with floral motif. Notched collar; two-button front. Bracelet sleeves. A-line silhouette. Contrast checked hem. Knee length. Cotton/silk. Made in Belgium. 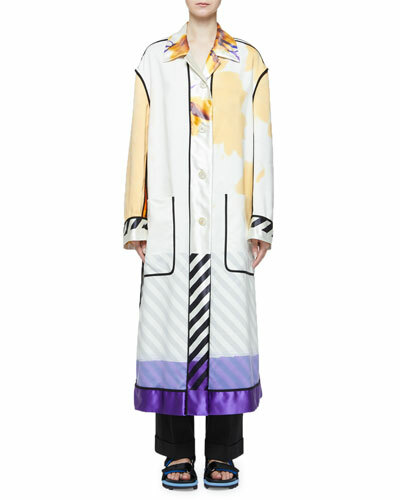 More Details Dries Van Noten wrap coat in feathered stripes. Notched collar; asymmetric wrap front. Long sleeves. A-line silhouette. Mid-thigh length. Silk. Imported. 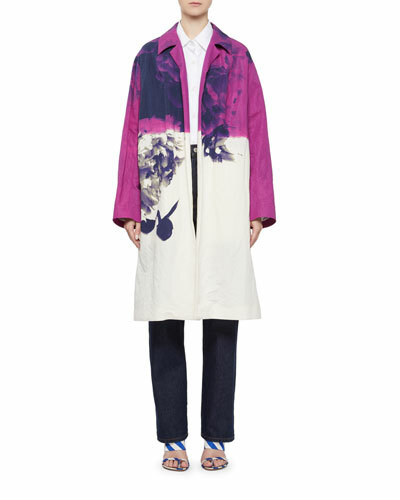 More Details Dries Van Noten hand painted multi-print coat. Notched collar; button front. Long sleeves. Front patch pockets. Oversized silhouette. Midi length. Even hem. Cotton/silk. Made in Italy. 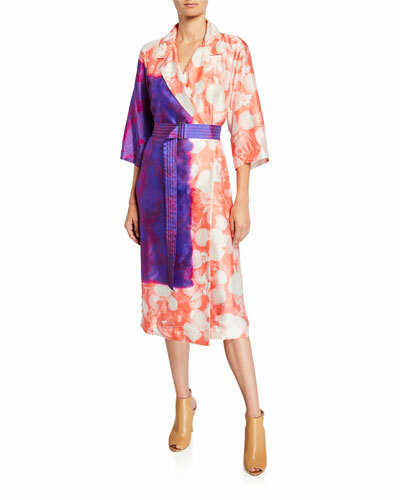 More Details Dries Van Noten robe-style coat in floral print twill with dyed detail. Notched collar; wrapped front. Three-quarter sleeves. Belted waist. A-line silhouette. Midi length. Viscose. Made in Belgium. 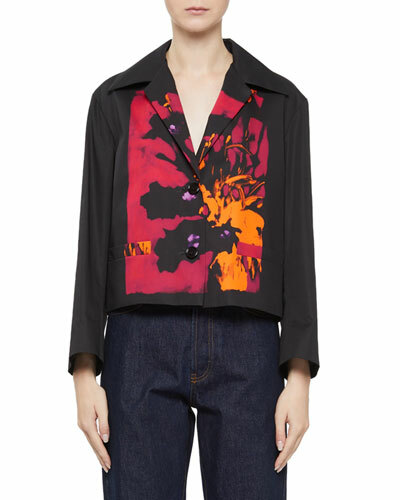 More Details Dries Van Noten floral-printed jacket with buffalo horn buttons. Notched lapels; two-button front. Long sleeves; button cuffs. Patch pockets at hips. Easy fit. Below-hip length. Viscose. Made in Bulgaria. 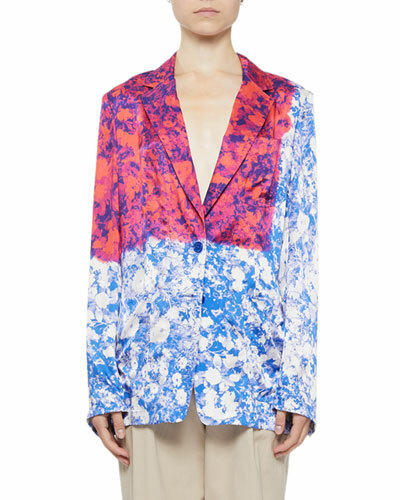 More Details Dries Van Noten "Volvic" jacket with placed floral print. Spread collar; two-button front. Bracelet sleeves. Side welt pockets. Boxy silhouette. Cropped hem. Cotton; buffalo horn buttons. Made in Belgium. 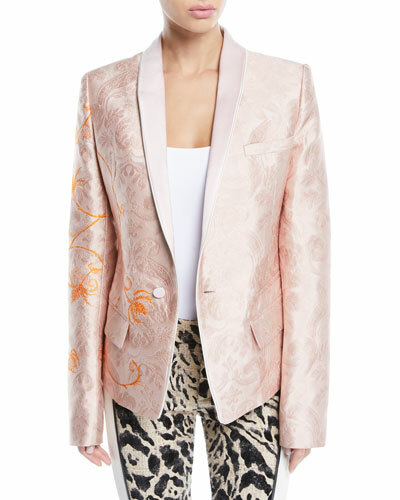 More Details Haider Ackerman floral-jacquard jacket. Shawl collar; one-button front. Long sleeves; button cuffs. Side flap pockets. Tailored fit. Double-vented back. Polyester/silk/metallic. Made in Italy.